Look, it’s one thing to hurt yourself playing Rock Band. But when you end up in medical journals for an injury sustained playing Candy Crush Saga, maybe it’s time to take a step back and assess your video gaming habits. 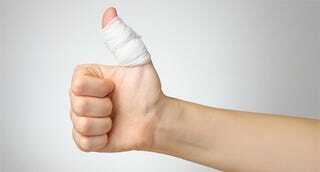 An unnamed 29 year-old California man has become the focus of a report from doctors at the Naval Medical Center in San Diego after tearing a tendon in his thumb playing the mobile game. He actually made the report for two reasons: one because, yes, he tore a tendon playing a phone game, which is quite an achievement in itself (livescience say the man says he was playing it “all day for six to eight weeks”), but also because of the time it took him to report the injury. Dr. Andrew Doan, the report’s co-author, found that the man should have been feeling pain every time he moved his thumb to play the game, but that “because, when people play video games, they can feel pleasure and excitement that are tied to the release of natural painkillers in the body”. Because the man was doing something he loved, similar to the “high” a runner feels even though their body is in pieces, he didn’t feel much pain, and so kept on playing despite the injury. Now he needs surgery. And maybe a phone game less likely to cause serious injury.